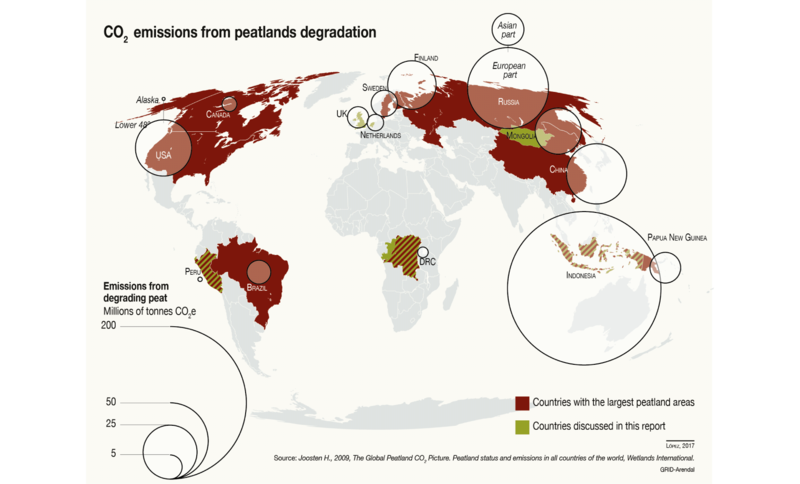 Emissions from peatlands per country (in Mtonnes CO2e). Note that emissions from peat extraction are not included in the calculations for European countries. It indicates where it is most urgent to undertake peatland rewetting action. Peatlands in pristine condition predominantly lock in carbon, however, degraded peatlands are strong net emitters of greenhouse gases. These emissions continue as long as the peatland remains drained and the peat continues to oxidize. This process can last for decades or centuries and is very different from the instantaneous emissions that come from clearing forests. Conserving pristine peatlands, as well as restoring and improving the management of peatlands and other organic soils, contributes to the reduction of greenhouse gas (GHG) concentrations in the Earth’s atmosphere. Peatlands are also important for food security and poverty reduction (FAO & Wetlands International, 2012). Current greenhouse gas emissions from drained or burning peatlands are estimated to be up to five percent of all emissions caused by human activity – in the range of two billion tonnes of CO2 per year. If the world has any hope of keeping the global 1. Source: www.epa.gov/energy/greenhouse-gas-equivalencies-calculator average temperature increase under two degrees Celsius then 8 10 urgent action must be taken to keep the carbon locked in peatlands where it is – wet, and in the ground to prevent an increase in emissions. Furthermore, already drained peatlands must be rewetted to halt their ongoing significant emissions. However, this is not as simple as it seems. Knowing the location of peatlands continues to be a challenge.